THIS WED, January 27, we don't have official "small groups", but we are meeting at Parkway Plaza Regal Cinema in the Parkway Mall in El Cajon at 4:45pm to catch a flick. 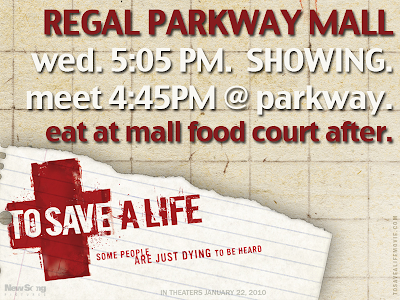 Our movie starts at 5:05pm and we're going to see "to save a life". Bring some money for the film and for dinner afterwards in the food court if you wanna hang out and eat and chat about the film with us. Film is 2 hours long. WE'RE GOING TO THE SNOW! On Friday, Feb. 19 through Sunday, Feb. 21 ENCOUNTER is headed to BIG BEAR! Wanna snowboard or learn how? Wanna ski or learn how? Wanna play and go tubing in the snow? Wanna just get away and enjoy this strange thing called cold weather? Wanna bond with friends and chat about life and faith and Jesus? If so, then we have space for just 40 of us on our Encounter SNOW TRIP! WHERE? : We're spending the nights at Pine Summit Christian Camp and then our days either at Snow Summit or around Big Bear. HOW MUCH? : Base cost is $85 which covers: all your transportation, all but 2 of your meals, and all your lodging. You can then choose what you do from there. Grab the full brochure with all the details. Grab the ridiculous amount of waivers and permission slips and such here. DON'T MISS THIS PARENTING SEMINAR! 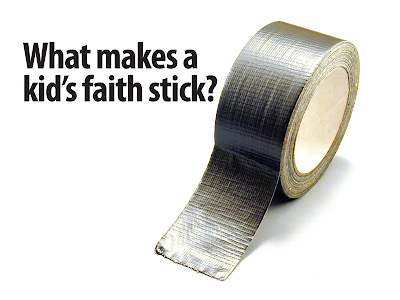 Ever wondered why some students chuck the faith of their younger years and some students STICK WITH IT to build their lives around it? If so, then we have a great seminar that will help you as a parent wrestle with the most recent research, and hear from some tried and true parents on how you can help your student's FAITH STICK. SUNDAY, JANUARY 31ST FROM 2 TO 7:30PM at Journey. Hear how our ministries at Journey are structured to help a student's faith truly stick. Ask your questions from a panel of people in the parenting trenches with you. Key Note Teacher: Ed Noble: Teaching pastor at Journey, father of 3, and veteran youth pastor of over 20 years. Key Note Teacher: Kara Powell: Executive Director of the Fuller Youth Institute, faculty member at Fuller Theological Seminary, author, mother of 3, and youth ministry veteran of over 20 years. Childcare for birth to 5th grade is available with pre-paid registration. $15 for one adult. $25 for a couple. You can sign up by e-mailing "office at journeycom.org" or you can meet us at our booth outside of the main worship center doors any weekend between now and Jan 31st. DON'T MISS THIS GREAT TRAINING! INVITE A FRIEND!